Palm Sunday is the sixth and final Sunday during Lent and it marks the beginning of Holy Week. For Catholics it is a day to commemorate Jesus as he entered into Jerusalem. His path was decorated with palm branches, which is a symbol of victory. Today, as Catholics attend church they receive palms that have been blessed as a reminder of Jesus' journey. There are many traditions that families partake on this day. Many involve exchanging these palms with family members. Others decorate the graves of loved ones, hang one on the door to protect them from evil spirits or simply place them in their homes for good luck. One tradition that seems to have slowly disappeared is the art of palm weaving, which has been in existence since Ancient times. Palm weaving is an art form that consists of taking palms and manipulating them to create various designs. Some patterns can be very simple while other patterns can be more complex. This art form has been in my family for generations. 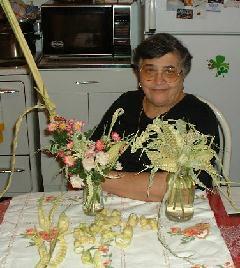 Each year my wife would make decorative crosses from the palms we received on Palm Sunday. 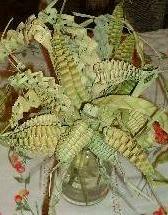 My Mother would get palms at the start of Lent and spend hours creating various decorated palms shaped like a cone, braid or rose bud. Once she finished them she would take them to church so she could have them blessed. I was always amazed at the designs she created. Like many traditions they seem to get lost and forgotten because no one ever took the time to sit down and learn how to do them and preserve them for later generations. With this in mind I sat down with my Wife & Mother to learn how they created these designs. At first, I watched how they created each pattern and I carefully wrote down each instruction and took pictures of the various steps. In addition to learning how to create these designs I found out that in the town my Mom is from they didn't use palms to create these designs. Palms were not available so they substituted the branches of olive trees. I also learned that what is a tradition in my family is not always a tradition in other Italian families. Many traditions are kept within towns because family members rarely left and moved to other areas of Italy. What is done in one town may not be done in a town only 50 miles away. You may or may not be familiar with this tradition, but that doesn't mean you can't take this opportunity to learn how to make decorative palms. To start, you can use the tutorials I created from patterns that my family uses to create various designs. If I could learn how to make these designs in a matter of hours then so can you.